Toys are hidden in the bedroom and you must help Max to find them. 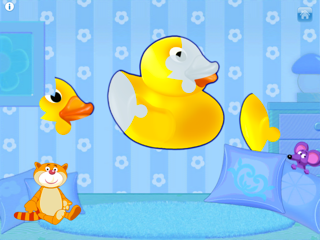 Children are offered a glimpse of the four toys they will need to find before the mouse pulls down the blind and they are hidden behind or inside common bedroom/playroom items. My children loved this activity, particularly as different toys were used in each game, and the toys were not always in the same place. Children can take their time to look and find items without the pressure of time limits. If they are having trouble, a prompt will appear on the screen to help them find the item. Incorrect answers are acknowledged with a shake of Max’s head, but there are no penalties and they get to try again. In this activity, children are asked to drag toys of a certain colour to a wagon. Toys are counted to a maximum of 5 as they are added to the wagon, which zooms away after the required toys have been added. This activity is wonderful for developing one-to-one correspondence, a basic Mathematics skill. My only issue is that “violet” is used to describe the colour my children and their friends would refer to as “purple.” I have used this as an opportunity to discuss how some colours have several names (e.g. Red, scarlet, ruby, rose etc). It isn’t a big deal because it is very easy to record your own custom voiceovers with the vocabulary you choose. See below for more information. Master 5 describes this as: “A picture of a toy comes on the iPad screen but a cheeky mouse messes it up so you have to help the cat put the puzzle back together.” That basically sums it up, although I’ll add that there are some supportive features, including a light picture underneath the puzzle to guide children, and pieces placed incorrectly will pop out of the puzzle area. My son likes the picture guide, but I’d like to be able to turn it off after he has played it a few times, just to increase the challenge. This is my favourite game in the app, possibly because I haven’t seen another activity quite like it in an app before. 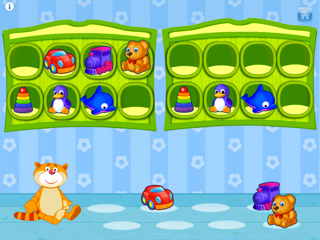 Children are presented with a pair of shelves, each with identical toys placed in them. Master 5 describes the activity well: “The mouse knocks the toys down and you have to put them back on the shelves in order. You have to look at the other shelf to see where the toys go. The toys move when you tap on them. I like this game because it is fun.” There are some good thinking and observation skills practiced in this app which will offer a fun challenge to the children. You can access the App’s settings by tapping the discreet button in the top left of the home screen and then solving a simple addition problem. This ensures no preschooler (unless they are extremely gifted with mathematics) can change the settings. Custom Voiceover: This is a star feature for me. You can easily record your own voiceovers to replace those in the app. All of the phrases used in the app are listed, so you can choose all or some. I have changed Hare to Rabbit, The violet toys to The purple toys, and bear to teddy. I intend to record voiceovers for all of them using my childrens’ voices. This feature will be great if you want to use voices with your own accent, or even if you wish to record instructions in a different language. Positive reinforcement: Max responds to correct answers with an animation such as clapping, a nod or thumbs up and some happy purrs. Help: Several activities feature prompts that appear if the child is stuck, and help them to arrive at the correct answer. No penalties: There are no penalties for incorrect answers, although Max might shake his head to reinforce that this wasn’t the correct answer, and there are no time limits. Characters: Both the mouse and cat characters are very appealing. Here is a hint: tap Max on the main screen to see him dance. External links are hidden: There are links to social networking, YouTube, the website, the appstore and an email address, but these are all hidden in the settings section and are inaccessible to children. Endless play: the game is not over until the child decides to stop playing. Custom Voiceover: I know I mentioned it above, but I love this feature as it will make the app even more friendlier for your children by allowing them to hear voices they recognise and love with the vocabulary that they use. It might even help children who are learning a second language. There are a lot of early concepts apps on the appstore, but not many have been thought through as well as this one. Each of the five activities has been well planned, with supportive features to help guide children to the correct answer while still offering them challenges. The feedback is supportive and encouraging, and you can customise the activity in terms of voice/vocabulary. The characters are entertaining and engaging, and the activities are fun and really educational. If you are looking for a great app for toddlers and preschoolers, then this is the one.